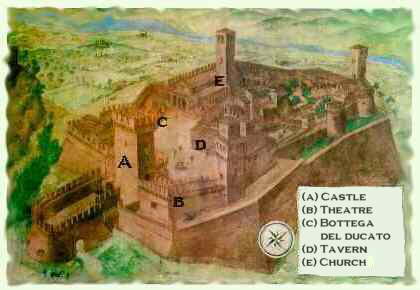 "La bottega di Vigoleno "
which still remains to bediscovered..."
I n the collective immagination of everyoneof us exists a castle. we imagine it as a scene from a romantic episode of loversand cavaliers. vignards as far as the hill tops, with rocks and castlesat its peaks. frenetic pace and conlvulsions of the industrial civilisation. to repeat its never ending story. T his is Vigoleno: wines, scenery,food dishes, events. Wines: the hills which from Vigolenogo towards "Val d'Arda"
which has recently obtained the Doc. inside a high surrounding wall which dates back to theend of XIV century. from all over the world, attracted to this land fullof delicacies.